A warming massage mask that nourishes and revitalizes the skin for a glowing, smooth complexion. This mask is great for Dryness - Fine lines and wrinkles - Dullness and uneven skin tone. This mask enhances the skin for a younger appearance. A unique, patent-protected variant of Echinacea Purpurea, GreenEnvy contains the highest known concentration of the phytochemical Cichoric Acida potent, a natural antioxidant that enhances the hydrating and purifying benefits of honey. The balm gently warms and transforms into a rich cream as it's massaged into the skin for an indulgent experience. Echinacea GreenEnvy honey is full of potent, natural antioxidants, and is made only by bees that live on Farmacys farm and pollinate the Echinacea GreenEnvy flowers. Cleanse and tone the skin. -Use the spatula to scoop the mask and spread a thick layer gently across the face from forehead to chin avoiding direct contact with eye and lip areas. -Massage for one to two minutes while it warms and transforms into a white cream. -Leave on for 10 to 15 minutes then rinse off. 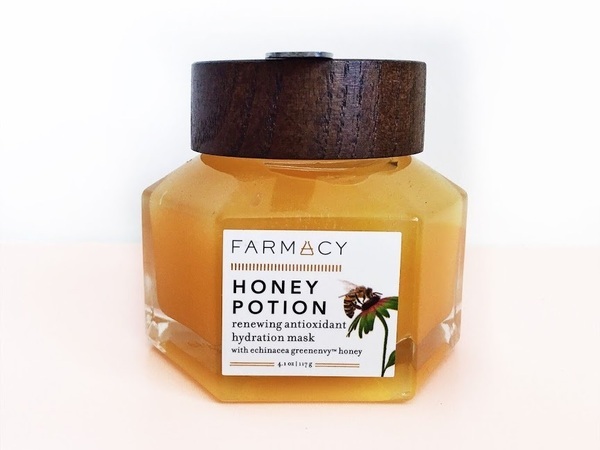 Echinacea GreenEnvy Honey: Full of potent natural antioxidants and is made only by bees that live on Farmacys farm; heightens the hydrating and purifying benefits of honey. Honey, Propolis, and Royal Jelly: Enhances skin renewal for a younger appearance. Essential B Vitamins: Help to smooth dry skin and renew its look. Ginger Root Extract: Helps soothe skin. Glycerin: Attracts moisture to the skin and provides hydrating effects for a moist, supple skin surface. Have you used any of the Farmacy products?